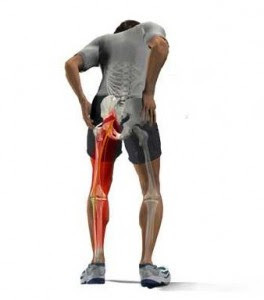 Sciatica is the pain that radiates down the buttock and back of the leg. In some cases, this pain may also involve the soles of the feet. Sciatic pain is usually sharp or burning in nature and is frequently accompanied by low-back discomfort. An important note to understand is that sciatica is a symptom of a problem, of something actually compressing the nerve roots that make up the sciatic nerve. This type of pain or discomfort is often seen in individuals ages 30 to 50 and it often does not occur from an event or injury but most commonly develops as general wear and tear of the lower joints of the spine. To understand sciatic pain we must first discuss the sciatic nerve and its components. The sciatic nerve is a confluence of nervous tissue that emerges from the spinal cord in the lower back region. The nervous tissue exits between the spinal bones known as vertebrae, which then converge to form the sciatic nerve. About halfway down the thigh, the sciatic nerve splits into the tibial nerve and the common peroneal nerve. The tibial nerve continues down the calf and into the sole of the foot, while the common peroneal nerve innervates the front of the leg. Sciatic pain is most commonly triggered by compression of the sciatic nerve. 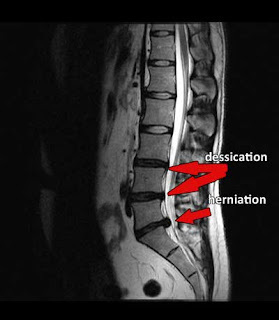 The compression will usually occur at the region near the spine where the nerve is formed. More specifically the bones, the vertebrae or the pelvic bones become restricted or out of alignment (subluxated) affecting the nervous tissue. Scientific studies reveal that vertebral subluxations are associated with an increased risk of low-back pain and sciatica. In addition to vertebral subluxations, the sciatic nerve may be compressed by a ruptured spinal disc or disc herniation or by bony spurs caused by osteoarthritis. Swollen or tight muscles in the buttocks may also restrict the nerve. In some rare cases, the sciatic nerve may be compressed by a tumor or inflamed by a disease process. Chiropractors take a unique approach to ending sciatic pain. The first thing we do is discover the cause of your pain, rather than merely covering your symptoms. Next, we work to correct the source of the complaint. Ending sciatic pain usually involves restoring motion and alignment to subluxated regions in the spine or pelvis. Chiropractors will use gentle and safe maneuvers called chiropractic adjustments in order to correct the misalignment. Instead of suffering with unrelenting leg pain which is associated with sciatic pain, seek the care that will determine the cause and address it. Sciatic pain is your body’s way of telling you that something is affecting your overall state of wellness. Do not ignore the signals your body is sending and seek Chiropractic care to alleviate your symptoms the natural and effective way. We specialize in Non surgical methods to treat Sciatica.